This gorgeous Provence Rose comes from two of the biggest names in food and wine. The domaine is owned by superstar chef Joachim Splichal, of the world-famous Patina restaurant in Los Angeles as well as the Patina Group, which runs several stylish restaurants around the U.S. He didn't hire just any wine consultant to run his operation. He hired Stephane Derenoncourt, the most highly respected consultant in Bordeaux. In other words, you're in pretty revered company here. For Splichal it was a homecoming, as he was born in the Provence and grew up cooking there until he opened his iconic restaurant in West Hollywood some 30 years ago. Today, Patina is located in none other than Walt Disney Concert Hall. Derenoncourt then hired winemaker Bruno Tringali, a Provence-born native, to run the day-to-day operation. Tringali has an incredible resume, with 30 years' experience in dealing with the diverse soils of the appellation. Provence is known for Rose, and this one is quite a beauty. It is crafted in the classic style, using primarily Grenache and Cinsault as the base. These two grapes interact seamlessly to present wave upon wave of different flavors, each one more exciting than the last. 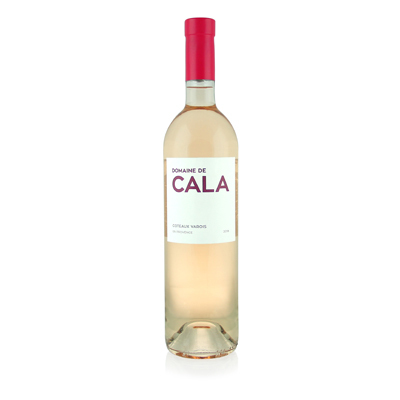 Domaine de Cala will settle for nothing less than outstanding terroir. It shows in the wine, with bold yet sensuous flavors. The pinkish hue is wonderfully inviting and hints at the lovely apricot and cherry infusion to follow.